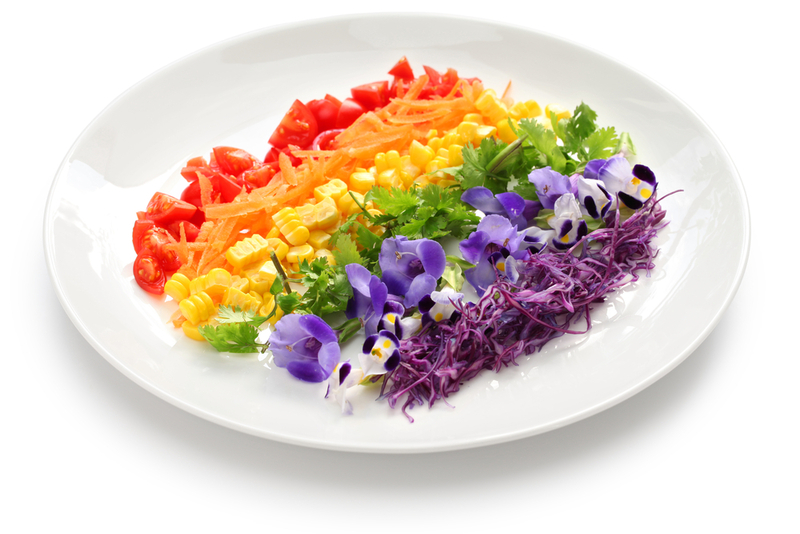 A rainbow is a beautiful thing but have you ever thought of creating a rainbow on your plate? 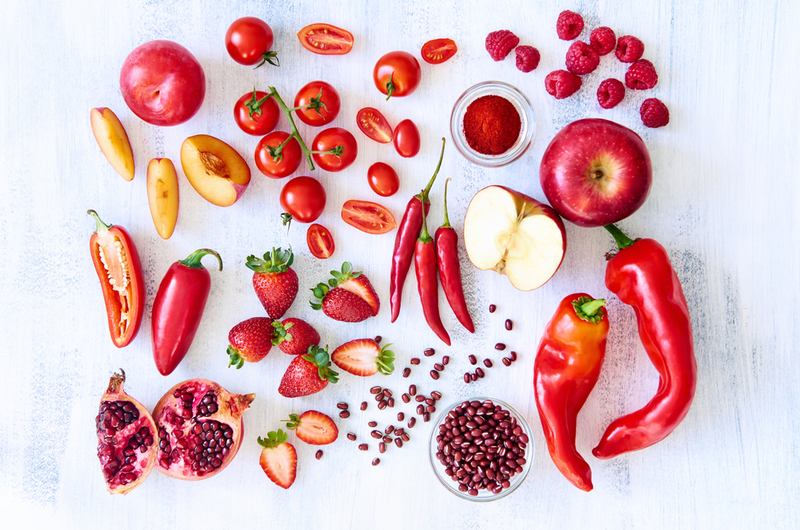 Adding more colours to your diet will provide you with a greater range of nutritional benefits: Clinical Nutritionist, Suzie Sawyer shows you how you can eat a more colourful variety of food and the great health benefits of a rainbow diet. Why is it so important to have colour variety in your diet? The simple answer is that nature provided us with a cornucopia of fruits and vegetables, each one with its own unique colour blend. All the colours represent important nutrients or compounds which deliver amazing health benefits; however, the colours blue, indigo and violet are not always easy to differentiate in food terms so we’ve merged these together under ‘blue and purple’ and also added white to create our own unique brand of 7! All red fruits and vegetables are loaded with anthocyanins, providing excellent antioxidant powers and helping combat free radicals. Every day, we’re bombarded with damaging pollution, stress, smoke, fried foods and smoke which all contribute to the free radical load; therefore, the more antioxidant protection we have the better. Red fruits and vegetables also contain high amounts of lycopene. Tomatoes are particularly high in lycopene, which has been particularly well-researched around supporting the health of the male prostate gland. Unusually, lycopene concentration in foods actually becomes more intense after cooking, so tomato-based sauces are a great way to boost intake. Tomatoes are also high in vitamin C and potassium which also makes them heart healthy. Orange is one of the healthiest colours of the rainbow! 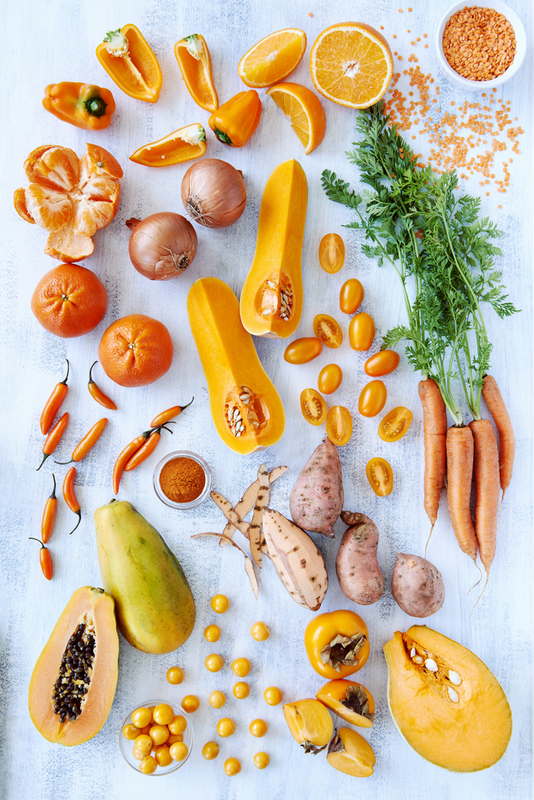 These fruits and vegetables have their naturally orange colour because they contain beta-carotene, which can be converted into vitamin A in the body and is needed for good eyesight. Beta-carotene is also a great antioxidant. Sweet potatoes, for example, contain some of the highest amounts of beta-carotene but also provide lots of minerals such as iron, potassium, copper and manganese, as well as vitamin B6. They make a great alternative to the standard jacket potato! 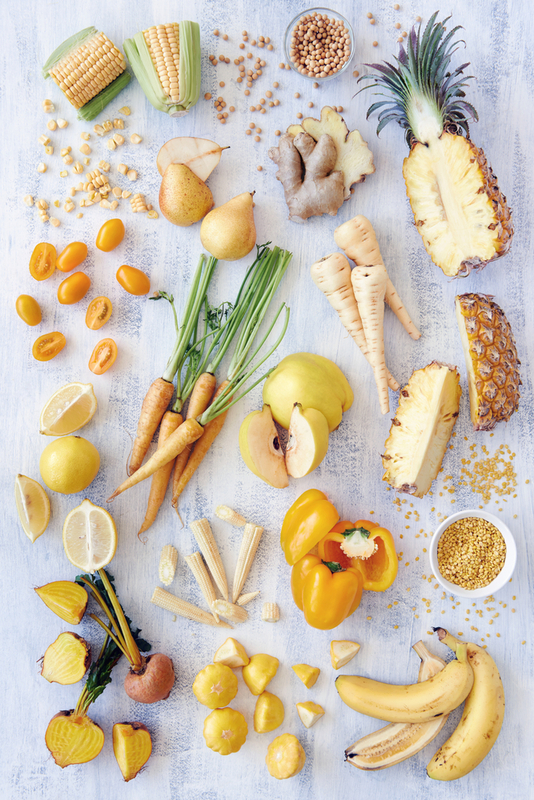 Yellow fruits and vegetables are packed with beta-carotene but also bioflavonoids. These are important compounds found in most fruits and vegetables, as well as being antioxidant powerhouses – particularly protective of the skin and immune system. These sunny coloured foods are also filled with vitamin C which is one of our essential nutrients and is particularly important for the immune system, bones, skin and energy production. There are so many green foods and the above are just a few examples. They are all packed full of vitamin C and vitamin A. We often associate dairy foods as being the main sources of calcium, but dark green vegetables such as broccoli, kale and spinach are also high in this bone-building mineral. They can provide a great dietary staple for the increasing number of people who cannot eat dairy. 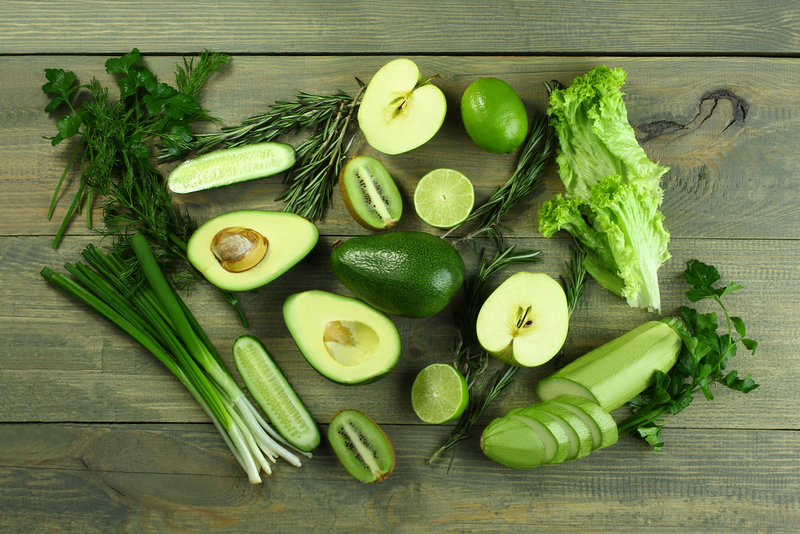 Green foods are also an excellent source of dietary fibre, essential for healthy bowels and digestion. 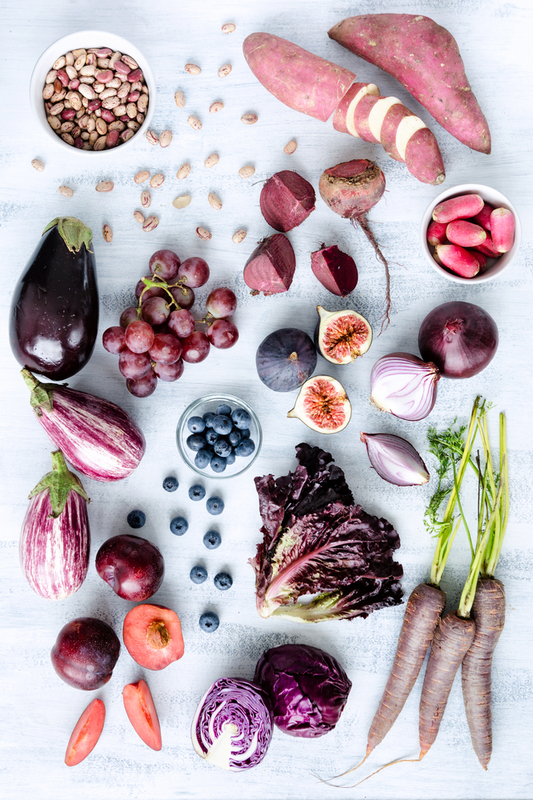 These beautiful dark coloured fruits and vegetables are the heroes of anthocyanins. As well as providing amazing antioxidant protection, these colourful pigments may also be protective of the aging process, especially cognitive function. In fact, research has suggested that blueberries may be protective of short and long term memory and they are so easy to include daily in the diet – just add to a bowl of cereal, and especially porridge. 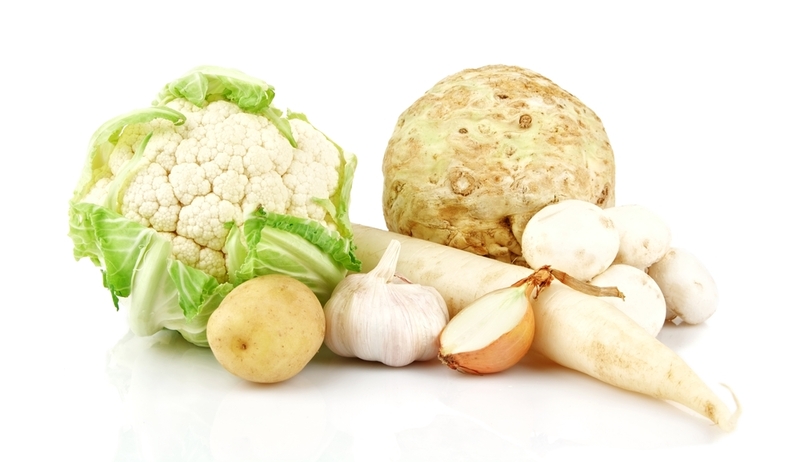 Although not strictly in the spectrum of the rainbow, white light is obviously where it all begins, and of course, there are very many white fruits and vegetables which bring us a bounty of benefits. Apples and onions are high in a compound known as quercetin, which is a natural anti-histamine. Sufferers of hayfever, and other allergies would be well advised to increase these in their diet, particularly in advance of the approaching spring/summer season. Why not make some delicious soups containing a variety of vegetables, including onions, in order to enjoy even more health benefits? Apples make a great snack and they have a low glycemic index, which means they release energy slowly into the bloodstream, keeping you going for longer! And now put it all together! 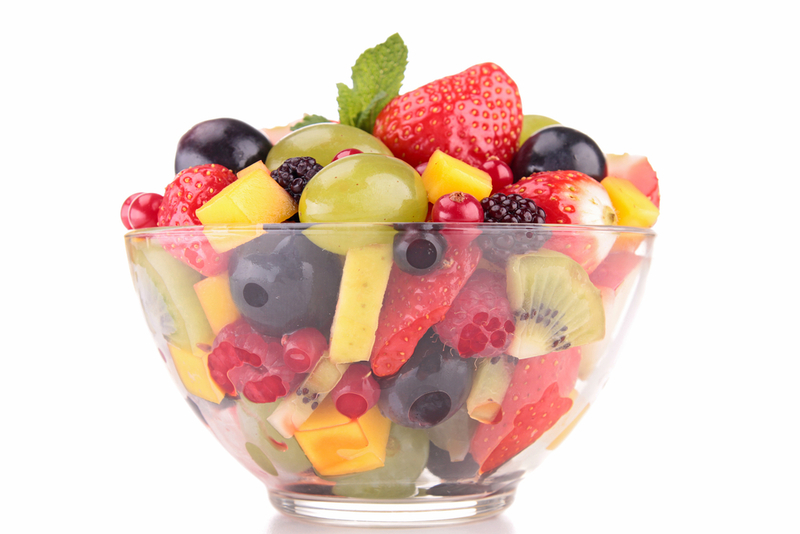 Make a rainbow on your plate: create a delicious fruit salad with mango, strawberries, blueberries, oranges, bananas and grapes. And don’t forget to squeeze a little lemon juice over the fruits to stop them oxidising and turning brown – much more appetising to eat the original vibrant colours! 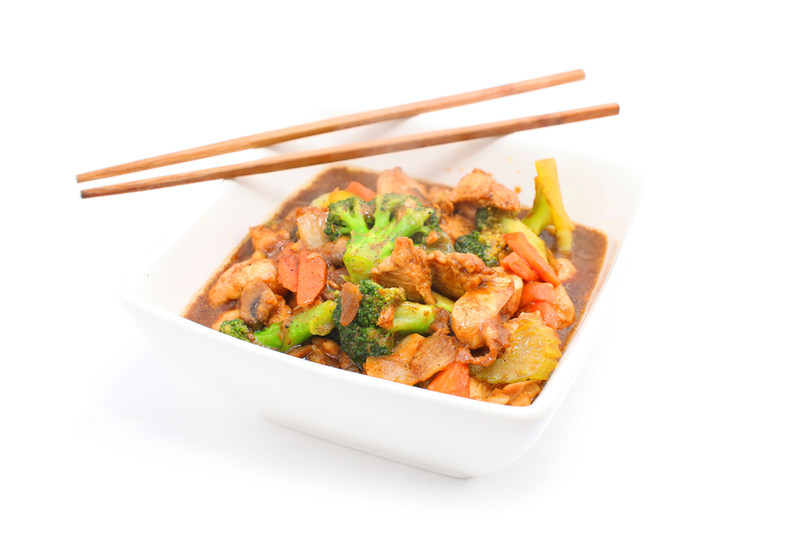 Create a Stir (fry): go for a mixture of vegetables and add some chicken or prawns: mange tout, baby sweetcorn, sliced carrots, onions, garlic, broccoli heads and courgettes, or whatever takes your fancy! Keep making up different variations. 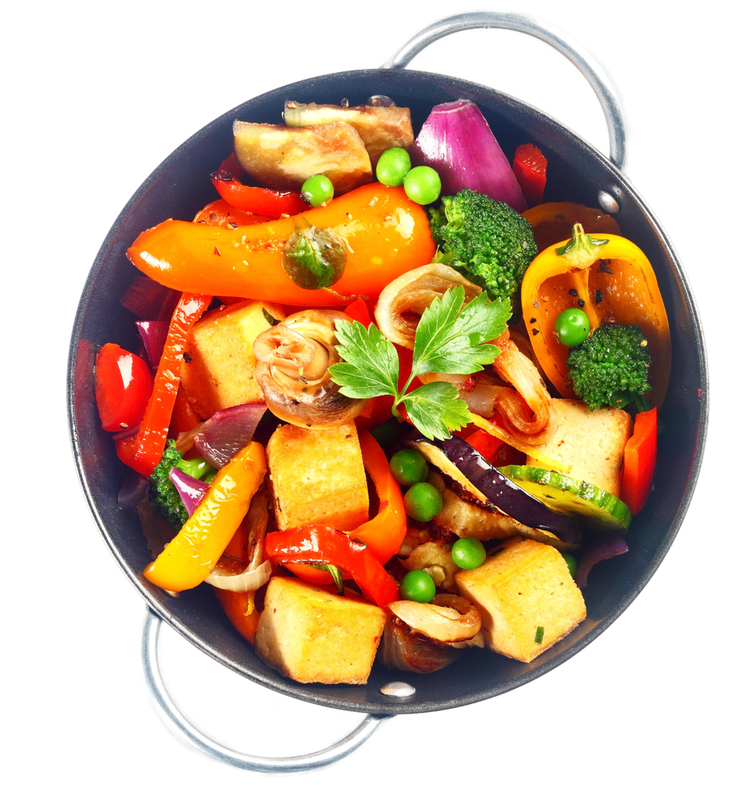 Cook a plateful of roasted vegetables: tomatoes, onions, sweet potatoes, courgettes, red peppers and some garlic. These make a wonderful addition to your evening meal and are also great eaten cold for your lunch the next day. Make some super soups: soups are an amazing way of including as many different vegetables as you can – healthy, convenient and very cost effective. 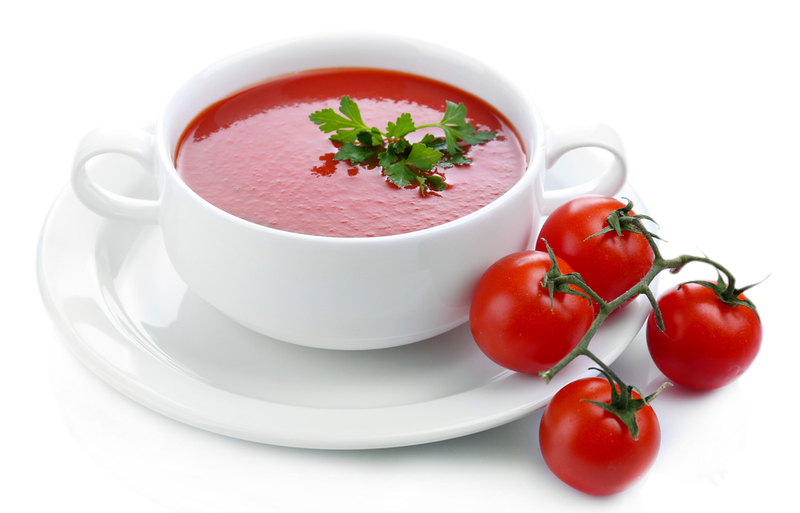 Soups are great all-year round for a vegetable hit and don’t forget there are many delicious recipes for cold soup, including gazpacho. 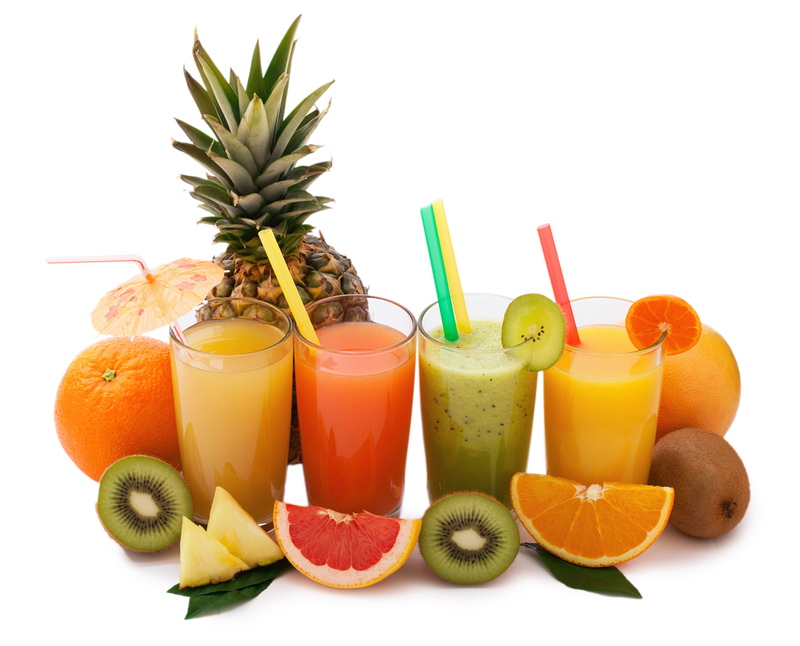 Get Juicing: juicing fruits and vegetables is one of the best ways of massively increasing your intake. Try to have at least one juice a day. One particular favourite of mine is apple, beetroot, carrot and ginger. However, experiment and you’ll never cease to be amazed by all the different tastes you can create – keep mixing it up until you find a few favourites! So, eating a rainbow diet doesn’t need to be difficult with so many to choose from and it could make a dramatic difference to your health and energy levels – so get colourful! ← 2015 Superfood: 5 reasons to love coconut oil!